Much has been written and discussed about the magnificent Okavango Delta but it is only through first-hand experience that the real essence of this incredible place in Botswana can be appreciated. There are scenes in the Okavango so indescribably beautiful that the comparison to the Biblical Eden do not seem too far-fetched with many people describing it as the blueprint of creation. Around every corner is a sight that brings gasps of awe, and with the delta made up of many parts the scenes of beauty are never similar. One of the most fascinating aspects of the Okavango Delta is the fact that it is a pristine water body in the heart of a desert, and although there are rivers that flow through deserts on part of their route, the Okavango actually ends in a lush wilderness in the desert. The heart of the Kalahari sits on sands that are 300 feet deep - and this is where the Okavango lies. 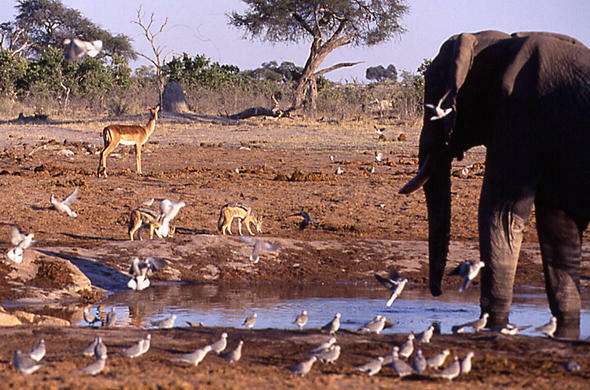 Because of this few places on earth have the variety of eco-systems and wildlife that are found in the Okavango. Deep water channels and lagoons of the permanent delta pour out over the seasonal floodplains, water-logged at times and dry grass plains at other times and within all this are islands of sand, from tiny termite mound outcrops to large forested land masses. So diverse are the eco-systems of the Okavango that is inhabited by all manner of creatures, from a profusion of tiny insects to the largest concentration of elephants in Africa and from myriad aquatic species to desert adapted animals. To add to the unique qualities of this African Eden the wildlife has adapted behavioural qualities that are not seen anywhere else on the continent. Animals that usually avoid water elsewhere actually use the waterways to their benefit in the Okavango. There are seasonal movements of animals in the delta depending on the water levels but in general wildlife can be seen anywhere in the delta at any time of the year and each season provides a highlight, be it a profusion of birds during the summer months or animals gathering on new grass with the floodwaters receding. Besides the range of eco-systems and profusion of wildlife the Okavango Delta is also one of the most scenically beautiful places on earth, a place where each vision showcases a special memory. It is here in the Okavango where many visitors have embraced their most special travel memories.